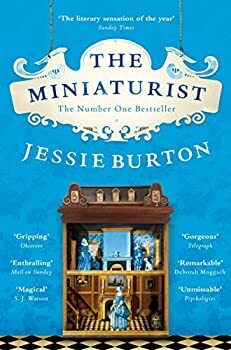 Jessie Burton’s debut novel, The Miniaturist, was undoubtedly a hit. I bought it because I was in an airport rush and it was winking at me from its bestseller, front row spot on the shelves. The Miniaturist’s popularity does not surprise me. It is an enjoyable read, packed with intertwining mysteries that tease throughout. I imagine a lot of people have fond memories of doll’s houses and were enticed by this aspect of the story, or at least, I was. But despite its potential, the ingredients of intrigue and magic never fully came together in any satisfying way. The story is that of Nella, a young lady who arrives in Amsterdam in 1686 to begin life as the wife of a wealthy merchant. Things start badly. Her new husband barely speaks to her and her sister-in-law treats her with pious disdain. Her husband’s one act of affection comes in the form of a gift — a magnificent doll’s house, the exact replica of the house Nella now lives in. Devoid of things to do, Nella writes to a miniaturist, commissioning a few pieces for the house. To her surprise she receives a number of things she did not ask for. As the stable lives of the household’s inhabitants start to crumble, Nella realises that certain details of the miniature pieces ring eerily true to real life. She begins to obsess over who the miniaturist is and what she is trying to say. I should make clear that this book is billed as historical fiction, not fantasy. Burton weaves the story of the enigmatic miniaturist into the very real lives of the dysfunctional family. And I accept that. But it was the idea of the morally ambiguous miniaturist and the creepy doll’s house drew me to this book (and given its title I can’t blame myself). What I found was another story entirely with the miniaturist as a curious side show. I felt slightly cheated, as if those aspects of the story had been included as an afterthought, a gimmick designed to draw in the crowds. At the real centre of The Miniaturist are the various problems facing Nella’s new family and their struggle to conduct liberal lives in a deeply conservative society. Nella’s husband has a black servant which causes much consternation in the town, her sister-in-law is unmarried and troubled, and her husband is hiding a secret that could bring them all to ruin. This leaves Nella with very little to do but sit and wonder about her doll’s house and her husband’s bad mood. The success of The Miniaturist may lie in the writing itself. The attention to detail and the richness of the world Burton builds makes it a pleasure to read. As for historical accuracy I cannot comment with any authority, but at any rate I wasn’t bothered by parts that felt unrealistic. After all, it is the privilege of the writer to craft the world they please. More problematic were the characters themselves. I found them flat (a word I use too often, because it so often true). I liked them, but didn’t love them. Nella felt familiar and I’m sure you’ll know the type — a determined heroine, extremely pretty, too modern for her time. I wanted more depth to her story, her dreams and motivations. I was left disappointed and confused by everything she did. The Miniaturist has lots of ghostly potential, but be prepared if you are drawn to it for that reason. The magic loses out to a very different plot. It is, nevertheless a nice read with some unusual ideas. In the fall of 1686, eighteen year old Petronella (Nella), newly wed in a hastily arranged marriage, arrives on the doorstep of her husband’s fine home in Amsterdam, and finds herself, like second Mrs. de Winter in Rebecca, in over her head, in a home where there are strange undercurrents and dark secrets swirling around. Her twenty-plus years older husband, Johannes Brandt, is kind but mostly absent and apparently uninterested in visiting her bed and making her a “true woman,” and her husband’s stern sister, like a Dutch Mrs. Danvers, runs their home with an iron hand. When Johannes gifts Nella with an extravagant miniature of their home and suggests she fill it with furnishings, Nella is torn between resentment that he’s given her a child’s gift and a growing intrigue with the intricate but odd furnishings and doll-size characters sent to her by the mysterious “miniaturist,” who hides from view but seems to know all of the secrets in the Brandt household. The subplot with the miniaturist adds a nice layer of fantastical mystery to the plot and integrates well with the main plotline. The magical realism is subtle enough that I questioned, for a time, whether it was even a fantasy element. But the amount of detail in the miniature dolls and pieces is uncanny, and Nella discovers that sometimes the pieces change in a way that reflects actual events, hidden secrets not only in the Brandt household, but in other Amsterdam homes as well. It’s an intriguing concept, but I agree with Katie that it’s not really at the core of the story Burton is telling; it’s a little odd that the book is named for an elusive character who barely shows up in the novel. The Miniaturist is of the genre of books that takes on social issues ― feminism, race issues, homosexuality ― and examines them in a historical setting. While this is a laudable goal, too often it results in an anachronistic story where a few enlightened characters with suspiciously modern social attitudes combat the prejudices and social values of their time. Moreover, religion in this story is personified by the greedy, hypocritical pastor. When a starling gets trapped inside his church, a woman tries to open the church door to let the bird back outside into freedom, but it flaps away behind the pulpit. Starling, she thinks, if you believe that building is the safer spot, then I am not the one to set you free. I was also dissatisfied with the murky, unresolved way the miniaturist subplot ended… and, to a lesser extent, the entire novel. So in the end it wasn’t quite the book for me, either, but it’s well-written and Jessie Burton did a massive amount of historical research for it, which definitely enhances the read. 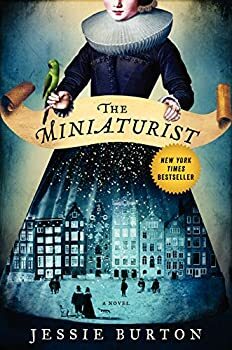 If you enjoy novels that explore social and sexual issues in unique historic settings, with an ambiguous, subtle layer of fantasy, it’s worth giving The Miniaturist a try. Published in 2014. There is nothing hidden that will not be revealed . . . On an autumn day in 1686, eighteen-year-old nella oortman knocks at the door of a grand house in the wealthiest quarter of amsterdam. She has come from the country to begin a new life as the wife of illustrious merchant trader johannes brandt, but instead she is met by his sharp-tongued sister, marin. Only later does johannes appear and present her with an extraordinary wedding gift: a cabinet-sized replica of their home. It is to be furnished by an elusive miniaturist, whose tiny creations mirror their real-life counterparts in unexpected ways . . . Nella is at first mystified by the closed world of the brandt household, but as she uncovers its secrets she realizes the escalating dangers that await them all. Does the miniaturist hold their fate in her hands? and will she be the key to their salvation or the architect of their downfall? beautiful, intoxicating and filled with heart-pounding suspense, the miniaturist is a magnificent story of love and obsession, betrayal and retribution, appearance and truth. You’re the second person I know who has found the book ultimately unsatisfying, and who felt that the characters were not deeply developed. I have a friend who does art dioramas. She loves stores that have miniatures, and she would probably enjoy this just for the doll house. I was really hemming and hawing on this one, most due to suspicions about just what you pointed to re the characters. Maybe sometime down the road from the library . . . Yes, give it a go Bill. I know I’m often sailing against the tide popular opinion so I would be interested in what you think! Katie, I had independently read it and written my review before I saw yours, but it’s interesting how much we agreed in our criticisms of this book! Really interesting to read your thoughts Tadiana. Looks like we had very similar views – I agree that the ending in particular was extremely unsatisfying.